Technology-driven innovation is the order of the day and more often than not, is also one of the ways firms of all types seek to create competitive differentiation. Investments in real estate technology have exploded from inside and outside of the industry leading to new opportunities at all levels. We are witnessing the emergence of smart buildings, where subsystems will be connected to improve the overall performance of buildings. Artificial intelligence will enable buildings to detect and repair structural changes without any intervention from the human being. Interesting! The total market size of smart buildings technologies can touch $24.73 billion by 2022. On one hand, there will be an abundant supply of new buildings. On the other hand, the older buildings will be retrofitted with automation and control technologies to keep themselves in the race. Today sophisticated real estate owners and operators have already gone paperless and online with their businesses. Most use some technology platform to coordinate all activities for the enterprise and for buildings. Still, many developers still rely on physical papers and don’t take full advantage of the Internet. Opportunities will abound to help them reap the advantages of the digital online world through moving to paperless offices and technology-enabled systems. In coming time, from a blue print to final layout, legal papers to administrative documents – all will migrate to the online digital format. Soon, machines will comprehend the clauses of an agreement easily and as a result, the need for human intervention will be reduced. Many property management, leasing and marketing functions will be done by AI, the same with some parts of the acquisition and finance process. The many other uses of AI in real estate have yet to be discovered, creating huge opportunities for those who can harness the power of this new technology to create efficiencies and new value for the industry. Enormous amounts of capital, both investment and research dollars are being poured into artificial intelligence. Estimates of the growth of the AI market run the gamut, but some suggest it could be as much as a $126 billion market by 2025. It is a combination of architecture design and gaming software. The potential uses for real estate can range from selling a new building concept at public hearings to enabling consumers to enjoy an experience of real time living in yet to be constructed houses. Leveraging special glasses, consumers can watch 3D videos of the property they are interested in. In nutshell, the real estate transactions will become more transparent, and the business will become more people centric. 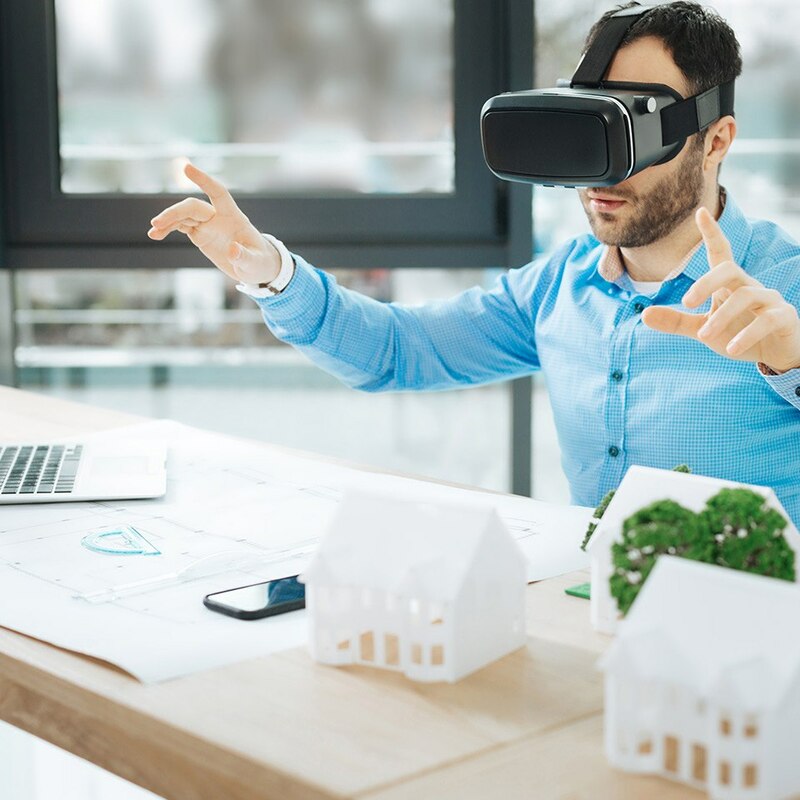 Many real estate companies are pushing technology to next level by providing virtual tours of potential properties to save time and cost and some are partnering with companies to sell products shown in tours. The virtual tour experience is almost equal to visiting a property. The infusion of technology in every aspect of our lives will continue to create demand for talent in all areas of real estate technology particularly as mobile technology, cloud computing and ever-expanding internet connectivity increase the ability for people to work from home, the road or virtually anywhere. With the help of online services, the buyers/renters/visitors will get a more realistic view of a property. Also, technology will further bring transparency to the market. Better engineering and advanced modeling systems, sales channels and customer proliferation will see a great impact with the increased use of technology. An explosion of new data created by technology advancements will create vast new opportunities for data scientists. That data is also fueling the emerging field of Predictive Analytics in Real Estate. Algorithms are being produced that accurately target customers and connect them with the exact kinds of properties they are looking to buy or rent, much like e-commerce portals are already producing personalized ‘wish-lists’ of items people have expressed an interest in buying online. The next step is predictive analytics, where algorithms not only match consumer with product, but predict future behavior or outcomes. Sensors are getting better at collecting more and varied data, computers and robots are taking even bigger leaps forward in analyzing and interpreting data, effectively learning from it and even predicting future results. Tasks that used to require human intelligence, like speech recognition or decision-making, are being successfully turned over to machines. As real estate companies increase technology usage, they also need to implement appropriate security measures to prevent and mitigate cyber intrusions. Some have gone as far as hiring new Chief Information Security Officers, a C-Suite position dedicated to cybersecurity. There are other vulnerabilities beyond information theft, such as impact on productivity, life safety, and protection. Perpetrators can use the IT systems to cause physical destruction, reputational damage, financial and/or productivity loss to the tenant. Such attacks could lead to substantial financial exposure, including fines and other costs, revenue loss, decline of shareholder value, and could impact human life and the environment.